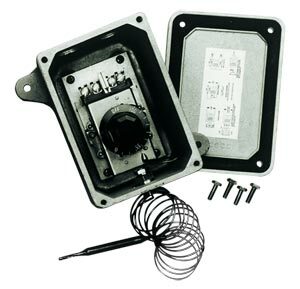 These models add a weatherresistant enclosure (AR-LT series) or an explosion-proof enclosure (AREP series) to the AR Series shown in the P Section. With the exception of the enclosure type, specifications are the same as listed. AR-EP models are UL listed for use on Class I, Groups C and D, and Class II, Groups E, F and G hazardous locations. Caution–Hazard of Fire: Types AR, ARR, AR-LT and AR-EP thermostats do not provide failsafe temperature controls for heating. If the thermostat bulb ruptures, the controller senses that the temperature is not at the setpoint and heat stays on. A backup high limit temperature controller is recommended for safety. *Not intended for use in hazardous areas.